Its thick glass, airtight sealing lid, and protective carrying pouch make this jar ideal for porting food. Glass containers are great for storing food, but most are not ideal for carrying it. This one is designed especially for that purpose. 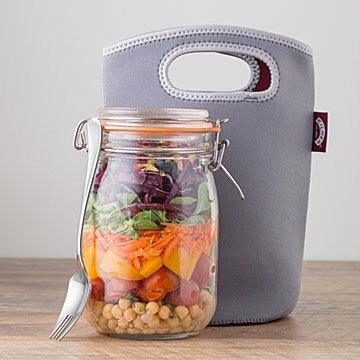 The 34-ounce jar's glass walls are far thicker than most, the flip-top lid seals firmly, and it comes with a neoprene carrying pouch to protect it from bumps and knocks during transportation. The included stainless steel spork has its own little pouch within the pouch. Save your pickle and jam jars for creative crafts and use this one for your signature salads. Made in China of recycled glass. Neoprene Sleeve: 9" H x 5.25" Dia. Neoprene sleeve is machine washable. Fork and jar are dishwasher safe, but rubber seal should be hand washed only. Do not use in microwave or with boiling water.